For the longest time I’ve wanted to draw a picture of my sister’s dog, Lillebror, but I’ve been putting it off for some strange reason. Now I’ve finally come around to doing it. 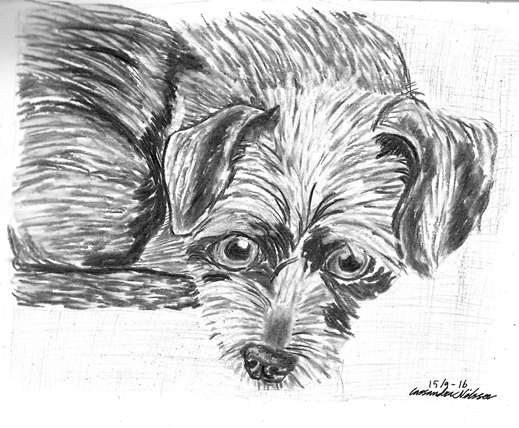 I haven’t drawn dogs that much, so I was pleasantly surprised when I still managed to capture his likeness. Especially since I was working with charcoal, a medium I struggle with. But this was a pretty good effort. The scanner, however, made it much sharper than it is in real life, as well as lost details such as the background. I think I’ll go back to photographing my drawings instead. If you’re looking for any logic to how I choose which drawings to show you, there won’t be any. I’ll just pick some random old picture which I like. I did the sketch for this back in, maybe, 2009. It then sat forgotten as a couple of lines in a sketchpad until last year, when I dredged it up and decided to finish it. For some reason I decided against cleaning up the sketch, even though the hands are a mess. I hadn’t done any work in charcoal for a while, but I’m still rather happy with how this turned out. 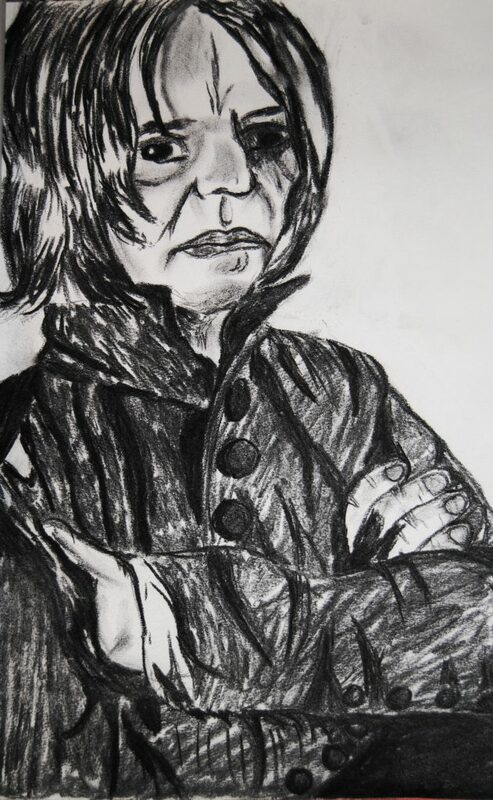 It’s recogniseable as Snape. I kept it really, really simplistic. 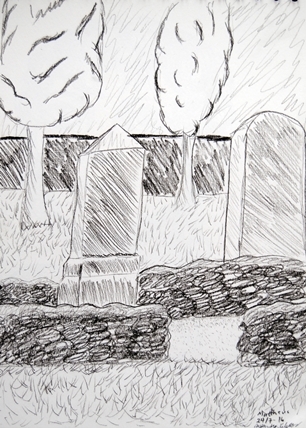 Basically I just wanted to capture the graves, the hedges and the wall farther behind them. Even while it’s so basic, I still like it. I like the lines, the shadowing, the feeling in the picture. Sometimes even a really simple sketch like this will turn out rather well. Mostly self-taught. At the moment I do most of my work with pens or ProMarkers, but some in charcoal or colour pencil. I intend to return to water colours in the future.